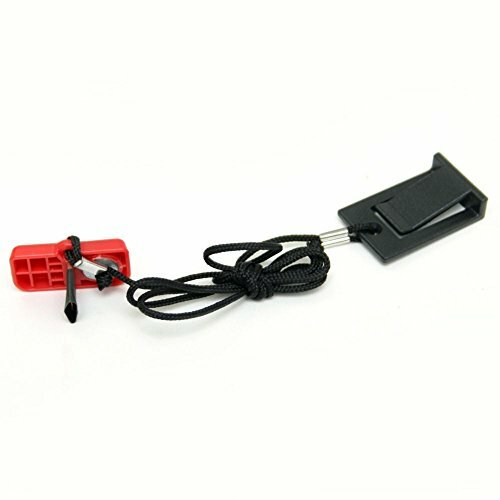 Horizon 1000105094 Treadmill Safety Key Assembly Genuine Original Equipment Manufacturer (OEM) Part for Horizon by Horizon at DCJ. MPN: 1000105094. Hurry! Limited time offer. Offer valid only while supplies last. Genuine Original Equipment Manufacturer (OEM) parts! This manufacturer-approved safety key assembly (part number 1000105094) is for treadmills. Genuine Original Equipment Manufacturer (OEM) parts! This manufacturer-approved safety key assembly (part number 1000105094) is for treadmills. Safety key assembly 1000105094 attaches to the console on one end and clips to your clothing on the other end. If the key detaches from the treadmill while the treadmill is in use, the treadmill stops. Always clip the key lanyard to your clothing when using the treadmill. Follow the instructions in the owner's manual when installing this part. For Horizon.